From concept to completion, Impact Event Production, along with our partners, design and construct amazing exhibitions that will truly impress your guests. We’d be delighted to discuss your ideas as to what you expect from the stand and then create visuals so you can see exactly what will be delivered and constructed on the build day. 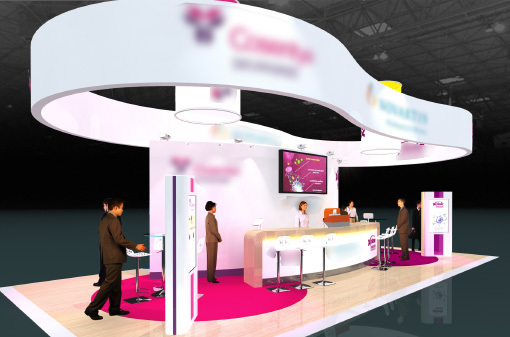 We have designed and built exhibitions throughout the UK and Mainland Europe for over fifteen years. We don’t want to reach your expectations – we want to exceed them. Maybe you’d like Barista Coffee’s served to your guests, or ice-cold smoothies, maybe a sofa area or a bistro table and bar stool area, a reception desk, possibly a private medical information area. "They always work within the budget to maximise the event, whether it be big or small, and give a superb service from start to finish"
"The level of commitment we receive, along with performance on event days is unrivalled"
"We have found Mark and his team to be consistently dependable, flexible, friendly, helpful, imaginative and competitive"
"Now that all the hard work has ended, I would like to take this opportunity to thank you for your help during the Royal visit." "Their knowledge of industry compliance along with technical and production expertise is critical to our events and the team always deliver on time and on budget"
"They are an absolute joy to work with and I, for one, hope to worth with them well into the future"
How about a video wall or some LED screens, some creative lighting, some innovative flooring, and of course YOUR branding! All the listed points are open to discussion so the end-result is a fantastic eye-catching stand. We will deal with the endless paperwork that surrounds every exhibition, book the electricity, book the wifi, order any graphics etc. From start to completion let Impact Event Production design, construct and service your next exhibition. Get in touch with us today for all your conferencing needs on 01937 841 361. We are always happy to hear from you no matter what the enquiry, we will get back to you asap.